1. Combine the sauce ingredients together in a bowl and reserve. 2. For the cakes, mix the prawn cocktail and crab meat in a bowl using a fork. Add all the remaining ingredients apart from the semolina and adjust the seasoning. 3. Divide this mixture into 15g cakes, about 1.5cm thick. Place the semolina on a plate and gently press the cakes in it to coat them, top and bottom. 4. Heat a large, non-stick pan over a medium-high heat and add a thin layer of oil. Fry the cakes, in batches, until golden and crispy on both sides. Place the cakes on kitchen paper to absorb excess oil. 5. To finish, finely slice the shallots into rings using a mandolin. Place a deep pan on a medium-high heat and add oil until it’s three quarters of the way up the sides. Heat to 140°C. Add the shallots and fry for 3 to 4 minutes until crispy and golden. Using a slotted spoon, remove the rings from the oil and place on kitchen paper to absorb excess oil and to cool. Crumble the shallots into small pieces. 6. 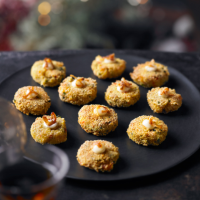 To serve, place a small dollop of sauce on top of the crab cakes and sprinkle some of the crispy shallots on top.